Christopher Hall is one of the the artists included in a special exhibition curated by East Street Arts in collaboration with the Dortmunder Gruppe at the BIG Gallery, Dortmund in October 2014. 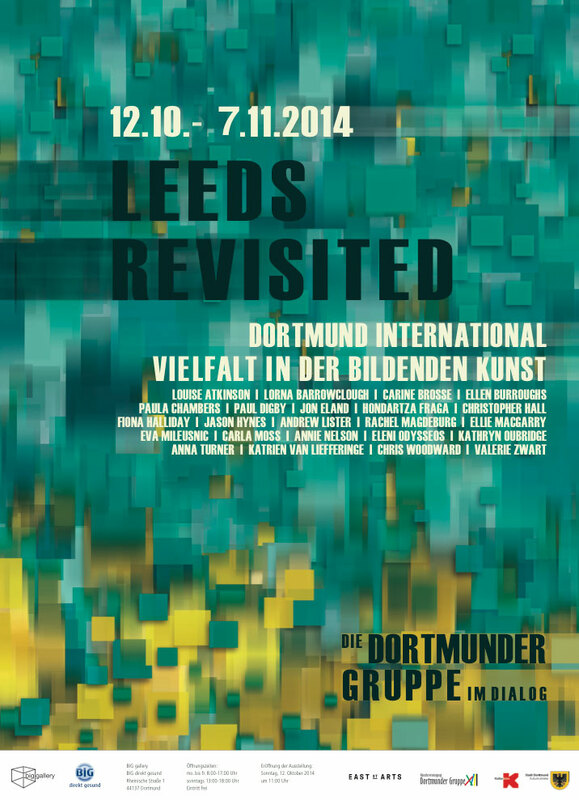 ‘Leeds Revisited’ 9th Oct – 7th Nov 2014. Leeds was twinned with the German city of Dortmund in 1969 and this project is a continuation of the ongoing creative exchange between East Street Arts and the Dortmunder Gruppe. The first East Street Arts Salon, launched in November 2008 at Patrick Studios, re-emerged in the Torhaus, Dortmund as ‘Salon:Dopplegänger’. A year later ‘Salon:Vardøgr’ was East Street Arts contribution to the 2009 Leeds Art Fair, celebrating the 40th anniversary of twinning between Leeds and Dortmund, which culminated with a visit to Leeds by German artists and their works later that year. Dortmunder Gruppe, originated in the 1920’s as the ‘Dortmunder Künstlervereinigung’ (“artists association”), disbanded in 1934 because the members were not prepared to comply with the dictates of the Nazi Regime. Re-forming in 1956, its roots lie in artists of the 50’s need to rediscover the buried traces of modernism. Although the Dortmund Group initially decided to devote its activities to abstract or non-figurative painting and sculpture, without however drawing up a programme of artistic principles, i.e. a manifesto. Other forms of expression were gradually taken into consideration. Today the ‘Gruppe’ has 22 members. One of the important aspects of collaboration with the City of Dortmund, is the development of contacts with artists abroad. Further information on the exhibtion can be found here.